V.com weekend vote: Does your violin, viola or cello label tell you the real maker? February 16, 2017, 11:33 PM · The label that you see when you look into the left f-hole of a violin (or other stringed instrument) can tell you a number of things -- sometimes it even tells you who made the fiddle! Of course, it's supposed to tell you who made the violin, but labels don't always tell the truth. Take, for example, my "Stradivarius" violin -- a turn-of-the-20th-century Germany factory fiddle that, rather obviously, was not made by the great Italian master. Of course, when I was nine, I entertained dreams that it was the real deal; after all, the label in that violin did not mention it was a copy. Other labels are a little more forthright; they might list a great maker like Stradivarius, but then upon closer inspection, they include telling words like "copy of" and/or "made in Czechoslovakia." It is nice, of course, when the label simply lists the real maker. For a while I owned a modern American violin, and I enjoyed knowing that the maker had actually signed the label that lay inside. When it comes to older violins, it is not unusual for a violin to simply carry a "fake label" that some violin shop put inside of it, long ago, to pass it off as something it was not. Sometimes the violin dealer can tell, just based on the features of the violin, who really made it, even if the label is wrong. Certainly, this complicates its value, but it is not a complete deal-breaker for a nice violin. For many student instruments, the label tells the model of the violin, or the company that made it. How about your instrument? What does the label tell you -- or not tell you? Does it list a maker, a model or a company? Does it reflect who actually made the fiddle, or does it only give a few clues? Please choose from the options below to tell us about the label in your main instrument, and tell us any interesting details in the comments. 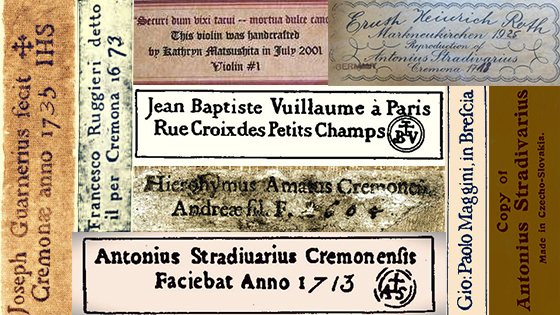 Does the word 'Stradivarius' appear on the label in (one of) your violin(s)? February 17, 2017 at 12:08 PM · "Copy of Chinese factory violin." February 17, 2017 at 02:37 PM · Says my name because I made it! February 17, 2017 at 02:41 PM · . . . not a label, but a very fancy brand burned-in to the inside of the back plate before assembly: "C Larsen Odense [Denmark] 1896" Seems to be a copy of a long-pattern Strad, but Antonio isn't mentioned . . .
February 17, 2017 at 03:05 PM · I voted that my "main" instrument's label is accurate. It names the two makers--it is also just three years old, and I know its creators. My other instrument, however, sports a label even I, a complete amateur in violin identification, can recognize as fantasy. The instrument is old, much-repaired, and virtually anonymous. Neither suffers from identity crisis: both sound just fine. February 17, 2017 at 03:06 PM · I bought both my main instruments violin and viola directly from the violin builder J. Anfinsen from Norway. I travelled to Norway to the litle town Vestby where J. Anfinsen lived. Thus I saw his workshop and played on his instruments and chose a violin and a viola. At that time he had several finished violins to choose from and two violas. He was a very nice and kind person. He invited me and a friend that was travelling with me to stay there overnight so that we could save expenses for a hotel. So I have a special memory connected with those two instruments. February 17, 2017 at 04:05 PM · Despite being old enough for a fake label at 200+, the consensus from luthiers who have looked at my main violin, which I voted based on, is that it is the original label showing the latinized name of the maker "Carolus Joseph Hellmer. My secondary violin has a hand-written label from an obscure maker "Georg Adam Krauch" so I tend to believe it is real and it doesn't change the value. My third, that I got for travel, etc, is new, unlabeled and probably Chinese. February 17, 2017 at 04:46 PM · There is at least one interesting case not offered in the voting choices, namely that the label correctly names the maker, but is not original to the instrument, or has been altered. There are a number of instruments whose makers sent them forth into the world with labels not their own (or perhaps no label at all) not to ride the coat tails of another's reputation, but instead to escape taxation. Matteo Gofriller of Venice was known for this. February 17, 2017 at 06:26 PM · My old violin was one of the typical German factory strad copies with the "copy of Antonius Stradivarius" label. My current one has a Francois Guilmont label, which is a French-sounding pseudonym for E.R. Schmidt, so not sure what to vote. February 17, 2017 at 08:24 PM · I have two violins. No doubts about the identity of violin #2, by Ifshin Violins, my practice and folk music violin which I bought new in 2002. That old violin came into my possession about 20 years ago, and, after 60 years of not having been played or looked after (due to the outbreak of WW2 and its aftermath), was badly in need of attention before it could be played (I didn't start using it until 2001). The experienced luthier who did that work would have been jumping all over the place if it was indeed what it said on the label. In fact, in response to my question he believed it is a good German copy dating from the late 18th century. Another luthier some time later has said much the same thing. While I'm on the subject, the old violin has distinctive water marks in the maple of the back plate, something I haven't seen on other violins, therefore providing unique in-built identification (I've photographed it). February 17, 2017 at 10:38 PM · My family "Mittemwald Strad" is one of those odd labels, it is a Strad copy but also clearly states "Made in Germany" the pencil in numbers are not legible, just 17??. From reading "The Violin a social history" I came to understand that these were made to inform the buyer that they were copies of an instrument of a specific period but modern at the time (late 1800's). It came to America with my wife's Great Grandfather who played it in church and at family functions and then took up residence in the attic until I found it, had it restored and have been playing it ever since. It "Speaks Easily" and has a good tone using Dominant strings. It also has a lot of intarsia which shows that the maker put a lot of time and effort into the decoration. At this point in my life it is the right instrument for my needs. I did have a soloist level instrument for a while but it did not speak easily for me (my teacher and the subsequent owner both loved it). The instrument tells me a lot. It has traveled far, has been pretty well cared for and the maker put more than a bit of effort into it. Getting a bit anthropomorphic - it likes hymn tunes and doesn't like singing much above fourth position. Its a good instrument for an amateur like me. I have to wonder where I will give it the next home when I can no longer play - it does need to be loved, cared for and played for generations to come. February 18, 2017 at 03:12 AM · The label affects the value of the violin, but it's the sound that really counts for a player, and when it comes to that, the label does not matter! It's so neat when you actually can meet the maker of your violin. And to have a violin with your own name inside because YOU made it -- wow! February 18, 2017 at 12:18 PM · Although I voted "copy of" a famous maker, this doesn't quite tell the story. My current violin does say "Joseph Guarnerius fecit" and the date 1741, it also gives the name of the maker, Konrad Kohlert, albeit in smaller writing and harder to read, because not directly under the f-hole opening. In the certificate the maker explains that he did not aim for an exact copy, so I guess you might say, the famous instrument was his inspiration. My previous violin, on the other hand, had "Schuster" and "Markneukirchen" in it. It was years, even decades, before I found out that Schuster was not the maker, but the company that sold instruments en masse. February 18, 2017 at 12:50 PM · The label in my violin is the name of the maker in his own handwriting. And I know it is true because I bought it from him. February 18, 2017 at 02:17 PM · French factory violin imported to US in '23 by Lyon and Healy. No maker name, just says Made in France on a separate smaller label visible through the right F-hole. February 18, 2017 at 10:37 PM · My label was made for the Beares company in London. Rather than the name of the maker, the label sports the name "Francois Barzoni" which makes me giggle because it's an Italian style violin made in France. I just love the joke, even if it was meant to mislead buyers back in the day. February 18, 2017 at 11:49 PM · My main violin has a label signed by its maker, from whom I bought the instrument, so no mystery there. My viola has a label inserted by the shop that restored and sold it (probably in the 1960s--I'm its 3rd owner since then) listing it as "German viola from the 1880s", but no original label or branding. 1. Choisi par [chosen by] Léon Bernardel, Luthier / Copie de [copy of] Antonius Stradivarius Cremonensis / Faciebat Anno [made in the year] 1714. 2. Nach [after] Joseph Guarnerius / gefertigt von [made by] J. Altrichter / ie Frankfurt a. O. anno 1883. 3. Paul Pilat [Luthier] / Kegadü Kessitö** / Presten 1869. **Can anyone translate these two words? Not sure what language they are. February 19, 2017 at 12:56 PM · Back when Metropolitan Music was in NYC, their catalog included and For Sale, a packet of "aged-labels". This would indicate that it was common practice to purchase one of their excellent in-the-white violins, usually made by Juzek, do some gradation, apply a finish and use whatever label suited the customer's whim. February 21, 2017 at 05:00 AM · Hello all, My viola label reads Joseph Kloz in Mittenwald an der ISer Anno 1774 It has the fancy border and is most likely a copy of the original label from that time period. The date is a full ink stamping. (no penciling in the last two digits) The viola has all the markings of a late 1800's copy; faded staining, heavy shellacking of the the body and neck, etc. The best part is that the maker must have had a great sense of humor. There are at least three faces that must have been "painted" in stain first, then covered with the full staining that, after fading, exposed the faces. There also appears to have been some kind of number "painted" in stain on the back in the center. It just must be a copy of some kind, because I couldn't be lucky enough to own a viola from 1774! I would be thrilled if it was made by the Kloz "Factory." It sounds great, so that is all that matters to me. February 23, 2017 at 03:59 PM · My violin has two labels and one pencil marking from a violin luthier-repairer based in the Bronx, but my violin is late 1800's German. I have had it appraised twice, and that is what I have been told each time. So the maker of my violin is still a mystery to me. I like that it is a mystery, it makes the fact that my violin and I have been united all the more interesting. Love the way my violin feels and sounds: like home.